There are 40 chairs and 10 tables. If each table has the same number of chairs, how many chairs will there be at each table? What do you need to do to solve this problem? The “correct” answer was the last choice, to divide 40 by 10. But the student called Lynne over and argued that he could solve the problem with any of the operations. Can You Solve the Problem with Any Operation? After Lynne described this incident, I began to think about how the problem might be solved using each of the operations, and how I would “mathematize” the problem for each. Using division seemed straightforward, and I could represent this situation as 40 ÷ 10 = 4. 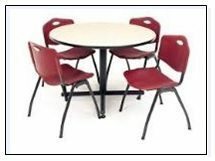 This problem situation is an example of division as sharing or partitioning, which involves dividing a collection of objects (here, 40 chairs) into a given number of equal parts (placed at 10 tables, each with the same number of chairs). I thought of this as a missing-factor problem: If the 40 chairs were arranged at 10 tables with the same number of chairs at each, what number could I multiply by 10 to get 40? I could represent that as 10 × 4 = 40. Well, if I were actually setting the chairs out, I could first put one chair at each table, which would use up 10 chairs. Then I’d put another chair at each table to place another 10 chairs. I’d do this twice more until I had placed all 40 chairs: 10 + 10 + 10 + 10 = 40. After four rounds, there were four chairs at each table. I was initially stuck about how to solve the problem using subtraction. But then I decided to think about it similarly to how I thought about using addition. Instead of adding 10s to keep track of how many chairs I had put out, I’d subtract 10s to see how many chairs I had left. After placing the first round of 10, I’d be left with 30 chairs. After placing another 10 chairs, I’d be left with 20 chairs. After subtracting 10 four times, there would be 4 chairs at each table and no chairs left to place: 40 – 10 – 10 – 10 – 10 = 0. As when I used addition, after four rounds, there were four chairs at each table. Word Problems can help build understanding of the meanings of addition, subtractions, multiplications, and division. I think that the standardized test item had an important goal: to see if students could connect a word-problem situation to the appropriate operation. But I think the item didn’t recognize the possibility of interpreting the problem with more than one operation or embrace the idea that there’s more than one path to get to a solution. I realize that it’s hard to measure either of these concepts on a machine-scored multiple-choice test, but it’s reasonable to include these ideas in the context of classroom instruction. Word problems are useful for developing students’ understanding of the meanings of the basic arithmetic operations. Thinking about word problems in this way keeps the focus on developing understanding. Present students the problem of putting 40 chairs at 10 tables so each table has the same number of chairs at it, and ask them to figure out ways to solve the problem with each of the four operations. Lead a class discussion for students to present their ideas.